Want to join a mastermind but don’t know which one? How your money stories keep you stuck? The power of stories… and more. 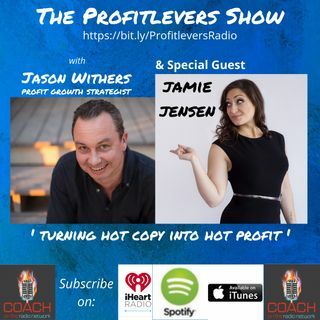 Award Winning Screenwriter, Business Strategist and The Creator of Story School, Jamie Jensen, joins Jason to discuss writing effective copy that tells stories to engage more deeply with your audience - and of course, how that translates into a more efficiently profitable business for you. They also jam about Jamie's ... Más informaciones own business evolution, her soon to be released new podcast focusing on creatives and money and the value of mastermind groups, which all adds up to an action-packed, value-filled Show! • What is the value of finding the right mastermind group? Jamie Jensen is an award-winning screenwriter, business strategist and the creator of Story School. To date, she’s helped over 700 entrepreneurs increase their sales by up to 900% with the power of effective storytelling. Prior to helping business leaders connect deeply with their audiences through copy, video, and talks, Jamie worked in story development in Hollywood, assisting writers in both film & television. Jamie is the co-director and executive producer of the feature film “Hannah Has a Ho-Phase,” which won her the “Best Feature Writer” award at La Femme Film Festival in 2013, and she most recently completed her 9th feature-length screenplay. Jamie divides her time between New York City and Los Angeles. When she’s not writing or helping clients with their creative business, voice, and story, you can find Jamie drenched in sweat from yoga or dance class, cracking inappropriate jokes, or curled up on the couch watching movies on repeat (#obsessed).